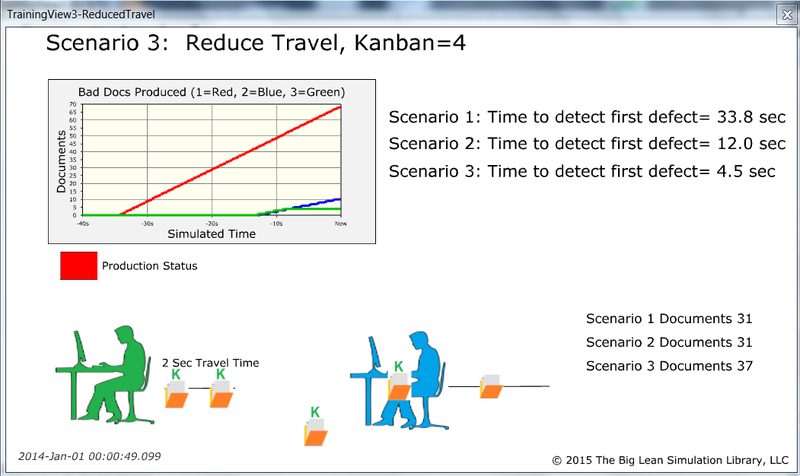 We will soon be releasing an Office themed version of the Push vs Pull with Kanbans manufacturing simulation. This concept works both for manufacturing and office applications. The new theme will make it easier for office folks to relate to. This entry was posted in New Simulation on March 26, 2015 by Jerry Levasseur. Here is a preview of the next simulation to be added. 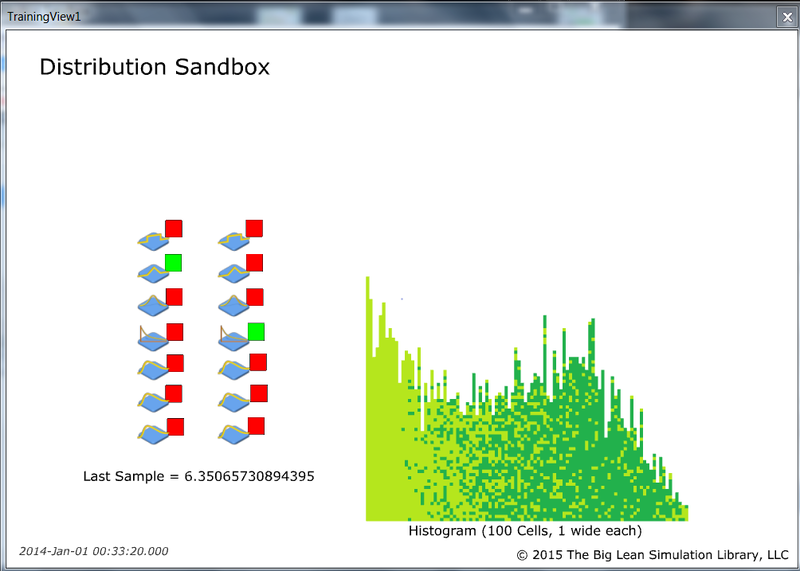 The user can set parameters on 7 different statistical distributions then run the simulation. This samples the distributions and shows them on the chart. This entry was posted in New Simulation and tagged Demonstrate, Distributions, Game, Play, Simulation, Six Sigma, Statistics, Training on March 22, 2015 by Jerry Levasseur. Here is a preview screenshot of the next simulation that will be added to the collection. This one is a goodie for Six Sigma trainers. 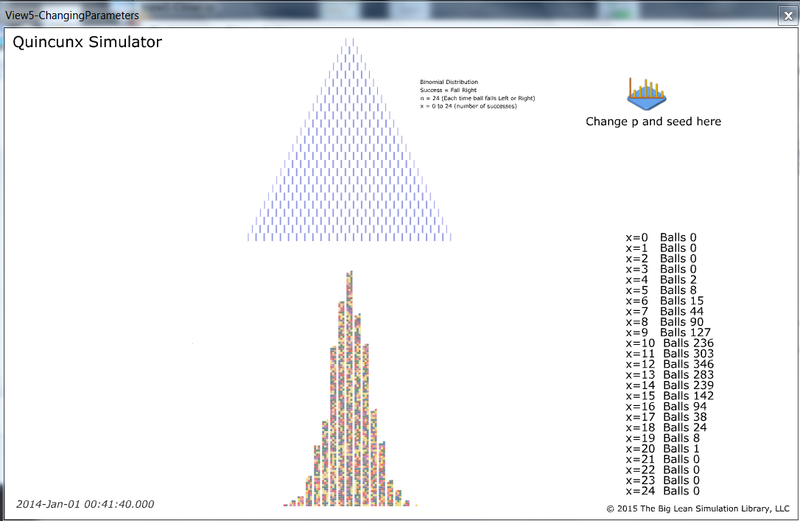 This is a quincunx (binomial simulator). Balls drop though the matrix at the top. On each drop to a lower level, they can fall left or right. After they go through the entire matrix, they stack up in bins on the bottom. This forms a binomial distribution (which approximates the normal distribution for large samples). Users can also change parameters, such as making the probability of falling left or right higher or lower. So the resulting distribution is skewed left or right. This simulation is still in draft stages, so may change before it is released. This entry was posted in New Simulation and tagged binomial, binomial distribution, Normal Distribution, quincunx, simulator, Six Sigma, Statistics, Training on March 16, 2015 by Jerry Levasseur. 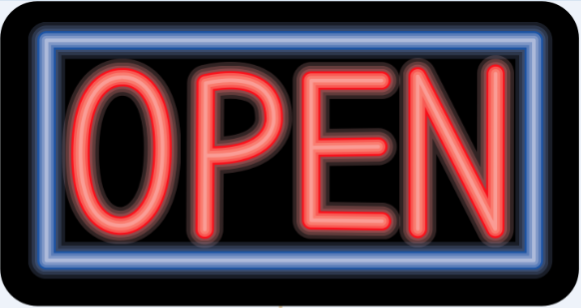 We are now open for business in the U.S. If you are outside the United States and have an interest, please let us know your country so we can prioritize. This entry was posted in News and tagged Lean Simulation on March 1, 2015 by Jerry Levasseur.